The push skiff has a solid place in the history of transportation on the water. It has a beginning somewhere far back in time, before there were mechanical engines to supplement human energies. 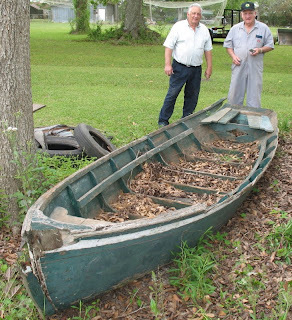 It was no doubt the recipient of earlier designs of European or Mediterranean origin, and it arrived on our Atchafalaya Basin doorstep as a sleek, pointed boat with a strangely narrowed stern. A boat that could be propelled through the water with deceptive ease, and so propelled over long distances. It was such an accepted piece of what it was to live and work on the water that a lot of people refused to give it up even after the gasoline engine became popular. Even so, progress was not hard to define if you were pushing the boat along at its slow pace and were passed by one of those newfangled putput bateaux going a sizzling four miles an hour. Progress was not as pretty, or as quiet, but it went faster and you could sit and watch the water go by without pushing your way through it. So, the skiff faded away until there are few left. A small number of men still have the skills and knowledge to make these boats, and you can see them on display (the boats) if you go to the regional fairs and festivals that feature traditional watercraft. It is even more rare to find one of the original old boats. A few weeks ago we visited a man who lives on highway 182, west of Franklin, St. Mary Parish, Louisiana. His name is Howard Freeman Sr. We went to see him because he was the person who most recently owned and used the old skiff pictured below. It came to him when he bought a camp on Fourmile Bayou in the early 1960s, and this boat came with the camp. He does not know more about its origin than that, which leaves us free to speculate (authority on traditional boats, Dr. Ray Brassieur, speculates that this boat may have been built by Pierre Part craftsmen). Mr. Freeman did use the skiff a lot for fishing around his camp, but over the years it passed from his possession to others, collecting the signs of age and disuse that it now shows, eventually coming to Bobby Hodnett (white shirt) in Baldwin. Bobby hoped to repair the boat but realized that by this time it was beyond salvation. He was on the verge of committing the old hull to the solid waste dump when his friend Edward Couvillier saw it and took an interest. 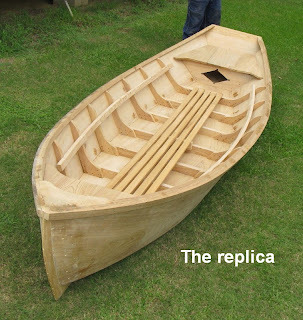 Edward knew that the boat was past redemption, but he also saw the possibility of using it as a model to replicate it in cypress, as originally constructed. The rest of this piece records how that happened. We loaded the boat onto a flatbed trailer and delivered it to Edward’s workshop in Oxford, St. Mary Parish. Edward is a boatbuilder/fisherman who has had space in this blog before. Several years ago he received an apprenticeship grant from the Folklife Division of the Louisiana Department Culture, Recreation and Tourism to build a cypress bateau and teach two of his sons how to do it. He did that and the boat he built has been featured locally as well as at the New Orleans Jazz and Heritage Festival. The boat at note here has been variously called a push skiff and a pull skiff. The usual means of locomotion is to stand in it and push forward with a pair of oars loosely mounted on the sides of the boat. Thus it seems more appropriate to use the “push” term. Edward had never built a skiff like this, leaving that to his brother for all the years a push skiff was used in his family. He built bateaux and Abner built skiffs. Abner has been gone for many years and now, Edward thought, at age 80, that he would like to try to do a skiff. He would get a head start by using the old skiff as a model. 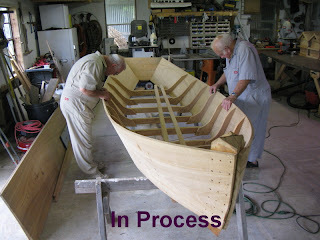 His son Larry, one of the apprentices of the earlier boat building, decided to make it his project and assumed the responsibility of buying the wood and spearheading the construction. The apprenticeship project is carried forward by this. Back to our visit with Mr. Freeman. In our conversations with him, he repeatedly used terms to describe the push skiffs in an emotional way. And perhaps the most striking thing he said, the most intuitive thing, was when he described the way the boat must be built. He said “If you build a push skiff, you have to put your soul into it. Yes, your s oul”. Not sufficient to just put nails into the wood, it must have part of you too. Some things people say resonate and have a greater than literal meaning. If a college student heard Howard Freeman’s words from the front of the room, they would be underlined. Edward took the old skiff apart, carefully preserving the wood that was not rotten. 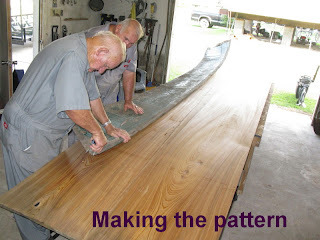 He laid the old wood aside to use as a pattern to build the new skiff. Larry in the meantime had located sinker cypre ss wood from the Anslem brothers in Morgan City. He would buy four boards from them. 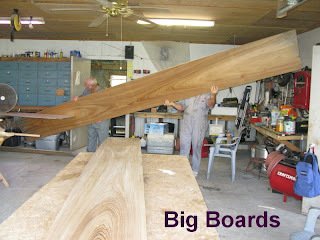 The boards were 21 inches tall by 18 feet long, and all of the new boat, excepting the ribs and timbers (forming the frame), was made from these four boards. Over the next several weekends, each piece salvaged from the old boat was used to model the new pieces. Although you could copy the old pieces, you could not know how they were originally made to fit together, and each time things had to be bent to curve in the right way, without splitting, it was an exercise in using the skills the men had obtained from a lifetime of woodwork. The cypress eventually did allow itself to be shaped, and the boat took form. As it did, Larry and Edward, neither emotionally demonstrative men, frequently remarked at how pretty the shape was, and how good the curves looked. I have known them for a very long time, and it was a wonder to see them wonder like that. This boat looks good because it is simple and curved and smooth, or appears to be simple anyway. The formulas that would describe the curves and lines and lengths of cut would not be so simple to most of us, but to Edward and Larry the fit of the pieces just made sense. The boat is pretty, that is all there is to it. 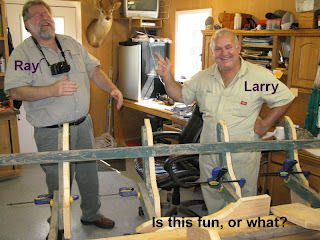 What is left to do is to make the frame for attaching the nine-foot oars to the boat. The frame is called a “joug” or yoke and is elevated above the sides so that the oars rest at waist-level to someone standing in the boat. 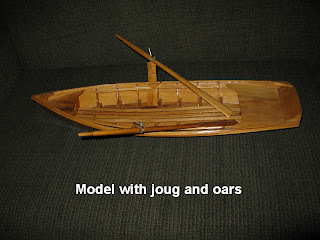 Larry made a model of this boat and it shows one way of making the joug and the oars that go with it. Is the making of this seemingly useless boat a waste of time? Not if we can profit from feeling good about being in the presence of something beautiful. No, decidedly not. Not if making sure we remember where we came from is an important thing. If you think only in terms of efficient transportation, there is no practical purpose for this boat now. Compared to motorized craft, it is slow and uses a lot of muscular effort. So why do it? Well, for some people, those who feel a connection to the ways that things were done in the past, there is a satisfaction, almost a compelling need, to recreate the tools that accomplished those things. This skiff is one of those tools. And it is beautiful. Looking at it allows you to drift back in time to small bayous and quiet cypress forests. It feels good to look at it, and imagine where it could have taken you. The river is at 4.3 feet on the Butte La Rose gauge today, falling slowly to about 3.5 feet over the next week. The Mississippi has a small rise coming but the Ohio has nothing to back it up at this time. Looks like we are in for the low water season for sure.